I probably should have foreseen the level of engagement that my latest article for the Common Weal White Paper Project – Beyond GERS – has generated. Most of it has been positive and the best of the critical response has at least been constructive. Spurred on by the mention of the paper by David Torrance in The Herald, I’ve become aware of several misunderstandings and misconceptions surrounding a few of the comments which have been made so feel that these must be addressed in a constructive manner. This paper represents a large leap away from where the independence debate has stood – more or less stationary – for the past two years so some further explanation of some of the points is warranted. This first clarification comes off the back of Kevin Hague’s article here which examines some of the figures used to back my arguments. His chief objection is that I used PESA 2016 (which covers up till financial year 2014/15) as the basis for my disaggregation of UK and Scottish geographic spends and that I should have used CRA 2015/16 instead (and, to his great credit, he makes the case that doing this strengthens our case from a financial perspective). Whilst this is a point to which I would not necessarily object I can only remind that Hague also admits that the latter source wasn’t actually published until after Beyond GERS thus was unavailable at the time of writing and that my conclusion makes it quite clear that this publication should be considered as a first step – to be updated as new data develops. We must remember that the data for 2015/16 will continue to be updated and refined for several years from now – most of these documents will show refinements and adjustments running up to five years before they “drop off” the table. We must also remember that whilst this study assumes the case of Scotland becoming independent today, the simple fact is that we are not, we will not be and it will be several years at a reasonable minimum before we are. Despite the efforts of some economic analysts to divine the state of the economy several years hence, quite probably the only certain conclusion one can reliably reach on such things is that these predictions will be wrong to greater or lesser degree, one way or the other. Would using GERS 2014/15 have made for a neater comparison? Possibly. Certainly though the baseline deficit was relatively similar so the task at hand not significantly different. But I’ll give you 20 £Scots to whatever that would be worth in £Sterling that the more shrill objectors I’ve encountered would have immediately demanded to know from where I was conjuring up £1.8 billion of oil revenue. On one particular point of attention, Hague wonders if I have overestimated the effect of overseas spending to the tune of £2.4 billion. This number was reached via a share of the total UK’s total overseas spend rather than the more modest figures assigned in CRA which applies a “who benefits” formula to spending where possible and a population share where not. The rationale for this choice being that, as outlined in the paper, one of the arguments used directly against Scottish independence was the breadth and reach of the UK’s diplomatic service. Whilst a credible case is made that the UK’s diplomatic service is, while broad, rather more inefficient than it need be I am left feeling comfortable with the idea that others who do not necessarily support independence would now surely recognise that if Scotland wanted to replicate that reach then it would be within our budget to do so. If it’s strictly an overestimate, that’s fine. I’d rather think of it as a potential for investment into Scotland being a genuine force for good in the world. In two of the cases mentioned, Spending according to the EU average or at NATO target levels, this represents an INCREASE in the amount of spending within Scotland, along with estimations of the economic impact caused by this increase. Only in one of the cases – a level of spend similar to Ireland and in accordance with their policy of neutrality and involvement in UN Peacekeeping missions – would this represent an actual cut to defence. If one were to consider reducing actual in-Scotland spending on defence and were to do it in such a way as to risk jobs – then it would be absolutely right to consider how those savings could be invested into other sectors of the economy which may carry with them far higher fiscal multipliers than defence spending does. As the IMF have noted more than once, rational defence spending levels are rarely decided out of “concerns about the state of the economy“. This said, defence is an issue which is very much bound up in policy and it is a subject that we really need to have a serious discussion about. Scotland’s defence requirements post-independence are likely to be very different from that of the UK as a whole or even Scotland within the UK. Then you’re likely to end up creating a defence force entirely inadequate at tackling the actual threats to our national security (The top four of which probably look more like: 1) Climate Change. 2) Internal unrest 3) Terrorism. 4) Cyber Attack. None of these need aircraft carriers, outward force projection or nukes to effectively combat). Common Weal will soon be producing our vision of what defence actually means in structural and strategic terms. One of the implications made by Hague – and which was picked up by Torrance – was that closing the tax gap to raise an additional £3.5 billion could be equated to a ~30% increase in income tax level. This is a particularly misleading way of representing this particular point, not least because the research quoted in the paper makes it clear that the inefficiencies, loopholes and avenues for avoidance and evasion lie far more within the realms of VAT, corporation tax, capital gains and inheritance tax. The fact that these taxes are all currently reserved to Westminster aside, the implication that closing the tax gap automatically means an increase in tax rates for those who already pay their full share and obligation is simply wrong. This mode of thinking, I believe, is symptomatic of the main problem that this paper is trying to tackle. Too many political commentators (on both sides of the debate) have gotten far too used to thinking about Scotland strictly in terms of being a wee region of the UK with limited powers. When just about the only major tax power Scotland has control over is income tax, perhaps it’s tempting to think of solutions purely in terms of that one tax but if you want to think about Scotland as an independent country – even if you’re against the idea and want to attack it – you must think about Scotland in terms of BEING an independent country. 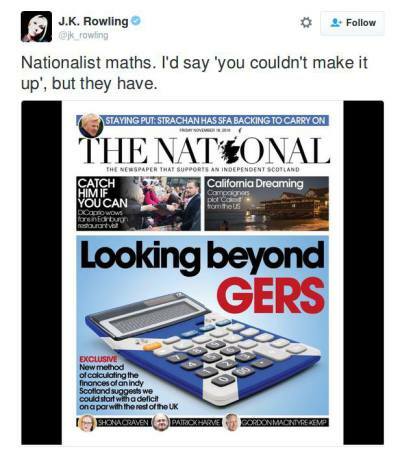 An independent Scotland would, of course, have full control over all of the taxes currently employed. Most importantly, it would be fully in control of the power and opportunity to completely dispense with the UK tax code and start again with a better, more efficient, more effective one designed explicitly for the Scottish economy. If a pro-Union commentator wishes to fight on this point then they have to be prepared to defend the current UK system, explain away its flaws and why we’re not getting any of the solutions that folk like Tax Research UK can identify as well as attacking any proposals that we push forward. The stated objective of the Westminster government in the 2014 campaign was to have the rUK recognised as the “continuing” or, at least, the “successor” state to the United Kingdom (the difference is largely semantic. In the former, the UK would continue unchanged in law but with reduced territory and perhaps a change of name. In the latter, the UK would strictly cease to exist but rUK would inherit all of the rights and obligations of the former state) and for Scotland to be recognised as a “new” state (The link prior went so far as to claim that the 1707 Treaty of Union “extinguished” the country of Scotland as a legal entity despite the UK describing itself to the UN 2007 as being composed of “two countries [Scotland and England], one principality [Wales] and a province [Northern Ireland]“). This state of affairs would carry with it significant advantages for rUK – notably, it would lessen any serious challenge towards their holding the UK’s permanent seat on the UN Security Council which was the case when Russia became the successor to the USSR – but carries with it many obligations also. The historical precedents are clearly laid out and extensively referenced in my paper Claiming Scotland’s Assets but readers should also consider G.F. Treverton’s book on the subject Dividing Divided States. Essentially, where one country successfully claims “continuing” or “successor” status then it accepts that all of the mobile debts and assets of the former state belong solely to it (non-mobile assets like mineral rights, military bases and public buildings – including public companies and any mobile assets deemed essential to their running – are almost always split geographically). This means that a “continuing” rUK owns all of the UK’s debt in its own name. Scotland can no more default on them than can a former lodger default on your mortgage. Now, if the side negotiating on behalf of the UK wishes to make the case that Scotland should take on a share of debts, perhaps by offering a share of assets to their value, then this is something that Scotland could consider, accept or refuse. There is a very good case to be made that Scotland doesn’t actually need or want a population share of the UK’s mobile assets. We may need a few £billion worth of military equipment – assuming we can’t buy newer or more appropriate equipment elsewhere. We may need a couple of £billion (those stalwart supporters of independence, Scotland in Union, estimated not more than £1 billion) to set up essential government departments currently lacking – assuming we can’t borrow the money at better rates on the open market. We may need a couple tens of £billions to support our new currency and set up the investment banks we’ll need to start rebuilding our economy. After that, it really does start to become a stretch to consider what other assets we would actually need which would justify accepting over £130 billion worth of debt. Answers on a postcard on that one please. The current rules regarding the UK state pension are quite clear. If you meet the requirements for one, including paying up to 30 years worth of National Insurance, then you are entitled to a UK state pension when you retire. Should you retire outside of the UK then, depending on which country you retire to, you may or may not receive an annual increment to that pension and changes to things like exchange rate and purchasing power may erode or enhance the value of that pension but the basic premise is laid out. In the absence of an agreement to the contrary, if someone has reached their 30 years contribution before I-Day or has even already retired then they can expect their full UK pension. If, for example, they end up paying 25 years UK NI and then 5 years of Scottish NI (or equivalent) then they can expect both governments to pay according to those shares. If someone lives their entire working life in an independent Scotland then the full share of that pension lies with Scotland. By this logic, at the point of independence, the full component of pension liabilities would fall on rUK as, at that point, no Scottish NI would have been paid. This should not be a controversial point as this was precisely the stance that the UK government itself took during indyref1 and is entirely consistent with the stance laid out above that rUK would act as the continuing state to the UK. At least one commentator has suggested that the UK could “change the law at the stroke of a pen” to block payment of extra-rUK pensions. I guess they could. It’d be a “brave” move though. I doubt they’d be able to pass that bill over the howls of horror from all the other British emigrants currently drawing that pension. I’d also love to hear their explanation to both rUK citizens who choose to move to Scotland at some point after independence as well as to their core voting base of those British nationalists who would certainly seek to retain their UK citizenship post independence and may even reject the offer of taking Scottish citizenship to which they may be entitled. That same commentator also suggested that, rather than a blanket ban on extra-rUK payments, the blockade could be limited solely to Scotland. I find it extremely difficult to suggest a way in which that this could be done which wouldn’t be seen as a blatantly discriminatory attack on pensioners based solely on place of residence. I’m far from a legal authority but I’m fairly sure that one could be challenged in the courts. Now, if an agreement over pensions liability sharing IS reached then this may change and, being that it is entirely a political negotiation, it’s difficult to predict ahead of time what that agreement would look like. Common Weal will soon be producing our own suggestions about what a Scottish pension system may look like and how it would interact with the rest of the social security network. This may include some form of cash settlement from rUK to Scotland to compensate Scottish residents for the NI they’ve paid into the UK system over the years. More on that in good time. It is true that the Scottish Government claimed in the Scotland’s Future White Paper that they would take up the pension liabilities. This was part of their stance that Scotland would share UK successor status with rUK and would share assets and debts. Remember that it was the No campaign which originally claimed that this wouldn’t be possible. If this has changed; if the pro-Union campaign wants now to seriously suggest asset and liability sharing. Time to make us a serious offer. We may even agree to it. 6. But the SNP said ‘X’ in their White Paper! Whether on pensions or currency or any other campaign point this is the comment which, to my mind, represents a total vindication of what Common Weal are trying to achieve through our White Paper Project. That we’ve moved the debate on so much that these segments of No campaign have now flipped from saying that Scotland’s Future was utterly without merit and should be scrapped in entirety to now demanding that its proposals should be accepted in full we’ve revealed that their own case for the Union yet to move on one iota from their position two years ago. They haven’t adapted their arguments to the new circumstances caused, especially, by Brexit and they haven’t even considered the possibility that when they demanded that the Yes campaign drop a previous campaign point and adopt a new one that we might actually do it. They’re still stuck in the Cave, blinking at the light and yearning for the shadows they sneered at two years ago. I completely welcome comment and scrutiny of this and other work that we produce. I am more than open to adopting suggestions where they contribute to the project and to updating figures as data are refined or as time moves circumstances on. I shan’t accept some of the more blatant misreadings of this report and I certainly shan’t accept some of the more low-brow comments dismissing this work based on my own academic credentials (as if one is incapable of utilising transferable skills or of ongoing learning after graduation) and as if this is an entirely solo effort with no more thought put into it than a casual personal blog rather than the extensively referenced, collaboratively researched and professionally peer reviewed work that it is. I’ve often found in this “post-truth” age that those who’ll gleefully tell us not to listen to “experts” when they disagree with them are all too often the same people who demand that we only listen to “experts” when others say the same thing. I’d like to hope that all of us can put that attitude behind us and start discussing the actual issues. Whatever way you look at it Oil has gone from +£11 billion to zero. We are poorer than rest of UK and collect less in tax and spend more on services than rest of UK. Means we have a huge deficit that we can cover by nationalising oil or raising taxes. Who will lend to us in these circumstances. European Union will require a commitment to cut our deficit from 11% to 3% and take on Euro. All these arguments and real data will be thrown at an Indy 2 referendum. What do think the result is going to be? You are incorrect to suggest Scotland, once independent, would have the same deficit as that presently assigned to it by Westminster. There are a number of areas of expenditure that would not be adopted and the article already points out that several £billion would be saved by not contributing to the rUK debts interest payments. There is no requirement for a new state that joins the EU to adopt the Euro immediately. It only has to agree that joining the Euro at some point in the future would occur. I don’t think this is a bad analysis, but it’s certainly an optimistic one. I’d say a split of assets/debt like the Czech/Slovak one is more likely than the Russia/other Soviet empire split. rUK would certainly hold some cards in terms of systems – pensions, welfare, tax etc. which would be costly to replace, and if access was denied could paralyse government activity in Scotland. A managed transition would be needed. The question of citizenship is an interesting one. If existing citizens will be able to claim citizenship in either country, you could see social benefits being at near parity. If populations could move to access better services, or simply present themselves at the point of use, then both governments would want to align benefits so there was no pull factor. Ironically, the post-BREXIT, post-UK would then be much like what federalists would like the EU to become. To a point this is already happening , those retirees that move to Scotland selling up in England , to see free healthcare as opposed to subsidised perscritpions. Certain medication or ways of treatment that are unavailable in England and in Scotland and vice versa means it can be bi directional. Which is one area that may see a future for Scotland , cannabis based healthcare , as this too is a reserved matter through illicit drug classification it is preventing the reduction in med costs as well as research. The biggest single contributor to any indy would be the legislation powers currently reserved , meaning the fiscal levers over and above the current devolved tax powers which is extra taxation well for being Scottish if the SNP and Holyrood choose to use it. Then we have the creation of an NSandI , you know those that do the premium bonds , where it can be used like a super lottery for infrastructure and housing investment , more so if this is devolved even further to the local level. Plus you also have the ability for deposits as well as local spend national lottery , where the areas that are poorest are usually the higher areas of lottery players and spending. Army wise we do have a little problem , but not insurmountable , via perhaps the Swedish model. This also has a secondary benefit , where further education is paid for , either before or after as a result of service. Even to the point of a National Service being engineering , housing and infrastructure – thus reducing the cost of certain things like road works. But of course this still means investment into machinery , ordnance and armoury , as well as the civil servants also. But there is NO major arms dealers , tank , military car makers in Scotland – so opens up the ability to source on the open market – not merely from a former UK market ie England. Then you also have Korea , China , America , Europe bidding on your custom and as a result keen to invest in a new currency and markets. I am quite a pessimist , have been my whole life , but when it comes to the independence of Scotland that pessimism pays dividends – I see solutions to the problems being better than the status qou. The pension question is now answered ish. The currency question is still the big question. Everything else depends on it , so that means a state bank and not a private central bank , so sovereign , with either old pound , pegged scots pound , or euro. This still hasnt been answered well enough to defeat the naysayers and project fear mongers…. this is the uphill struggle. It was never the case that Scotland’s finances depend on the price of oil and the tax raised on it. Our GDP without oil, on a population basis, is almost exactly the same as the rest of the UK; oil is the cherry on top of the cake. Given our educated workforce, our natural energy resources (excluding oil), our multiple exports of food, drink and technology, (excluding oil) and with an independent government, with the powers to grow these rather than stifle them, what might we achieve? In particular England is rapidly running out of energy and will brown out soon without our energy imports, despite charging exorbitant amounts for us to connect to their grid.. We are building two new interconnectors to transport electricity south. I suspect that is a barrel that Ruk might wish not to be over. Energy 2.0 , state owned is the future beyond the cherry. This is why I often prefer the union of the Nordic states as opposed to the EU or UK , where they are subject to the same eco generation and looking for a future with an EU exporting energy grid. State owned is their future too. In our debates with the Unionists they will simply bang on about GERS and Scotlands ‘public debt’ regardless of alternative figures. We have to attack the Unionists on their terms and develop a source of public funding not dependent on current taxation which is volatile. One of the few (rough) precedents for Scotland leaving the UK is the creation of the Irish Free State in 1922. When this happened, did the UK continue to pay pensions to those who now lived in the Free State ? Dont think there was such a thing as a state pension pre 22. Old Age Pensions Act 1908 followed by National Insurance Act 1911 so there was an old age pension in 1922. I’m not sure what happened in 1922/23, but from the 1940s onwards pensions were paid to those Irish citizens who had contributed whilst living in Britain. Like my mother-in-law. Excellent work Craig. Re Debt, whilst as you and the UK govt. make clear, an independent Scotland would have no legal liability to a share of UK debt, and therefore can’t possibly default on it, we do have a moral liability to our share of it. Likewise, rUK has a moral liability to Scotland in a number of areas. For example, if not the greatest act of larceny since the Spanish stole the Inca gold, in Alex Salmond’s words, Scottish Oil represents the greatest mis-selling scandal of recent times. In particular, the persistent lying in the 1970s (in the run up to the devolution vote) by the UK goverment to the Scottish people, in direct contradistinction to what they were being told by their own commissioned expert, about the likely effects of Scottish oil, were Scotland to be have control over it, either as an independent state or a devolved government with an Oil fund, is morally exactly on a par with an investment adviser telling you an asset is worth a grand knowing it is worth a hundred grand and buying it off you at that price. My reading of work, by e.g. the Cuthberts, suggests that compensation for that on the usual lines- to the place you where you would be on assumptions of reasonable prudence would leave rUK with a net liability to Scotland (taking into account Scotland’s share of debt) of £150 billion. We could be lenient and allow them to pay it up, without interest, at say £15 billion a year over ten years. There are also moral liabilities rUK has should Scotland become fiscally autonomous, or something near to that, prior to independence, in particular the ‘Union Dividend’ promised to the Scots if they voted no. Effectively that said that the Scots would not pay for the ‘Scottish’ fiscal deficit, as counterfactually conjectured by GERS, but only their share of the UK deficit. That could be effected, in an alteration to Barnett, by a transfer, in Year One, from UK to a genuine Scottish government ‘hard budget’ account of an amount sufficient to reduce the Scottish deficit, as calculated by GERS, to the UK level, with the size of transfer being altered up or down in future years according as the UK deficit, as a proportion of GDP, goes up or down. Thus eliminating the supposed difference in deficit levels at a stroke (of course we don’t have and can’t have a deficit just now, as we are not fiscally autonomous, all these calculations are counterfactual conjectures based on assumptions which, when varied, give very different results). What we must reject is the constant message from British Nationalists that Scotland has moral liabilities to the UK but the UK is beyond Good and Evil and can lie, cheat, and break promise as much as it likes. Of course that the UK (i.e. essentially England, to an 84% approximation) has those moral obligations does not mean it will abide by them, far from it. That would require political leverage from the SNP in Westminster, and that will hinge on ‘events’, e.g. on whether civil war does break out in the Tory party and May needs SNP votes etc. I have often wondered why Holyrood has not brought this to the EU courts already regarding the subterfuge , ie theft , as well as the reclassification of the North Sea. Its something that any serious drive politically should be done , which may be another reason why any special EU deal will be prevented – hard to go to the EU courts if your not in the EU. Comparatively has Norway not got 2x the population of Scotland and has drawn the same amount from the north sea as Uk has – to where they have something like 600b as a sovereign wealth fund? Our Holyrood is just as secretive TODAY as Wesminster was with the McCrone report – have you had a look at just how many finance and housing committees move the Public meetings to private chambers? Perhaps then its the Glass houses? Just noticed Florian’s question. The answer, I’m pretty sure, is yes. Like many Scots I have Irish as well as English relatives (the former by marriage). The older ones born before the War of Independence continued to draw UK pensions (as well as Irish pensions) until death at an advanced old age and delighted in taking money from their former enemy! The timeline of UK pensions seems to suggest it was a means tested benefit between 1908 and the provision of universal coverage in 1948 with the National Assistance Act. Though that seems to break down, resulting in a trade war. A very thorough and interesting article, but I would be a little concerned by the doubts cast on it by leading international economist, J K Rowling. I suspect that Rowling, a writer of fantasy, is richer than any economist alive, who concentrate on trying to understand the market. If our Fictional economist was offered a tax base better than that of UK in an independent Scotland then I doubt she would be as anti indy. Remember she is a product of Blair and the subsidies of the middle class benefit system , now looking down on lower class benefit system – She got where she is through hard work and luck granted , but still subsidised regardless. IIRC shes worth 220m , and with any projected income from HP et al this may well double in the next 10 years – or sooner if the franchise is just like star wars sold off to Disney for a couple of billion. You would have thought though she would have been very involved in the creation of a national film studio – but no , writing fiction is better than writing history. So perhaps we should be involving her and those like her , bringing them in to investment in Scotland , where their profits would be enlarged , rather than punitively taxed instead. But ironically such taxation powers remain in Westminster. The combined wealth of these people , and of course those offshore entities and land owners that own half of Scotland should be given the carrot and the stick – rather than just one. If we want investment , and we do need it , then we may well have to declare certain investments free of tax as a result. Or we could just approach the jewish bankers and sell off our soverignity through a central bank instead. Incidentally it is not just Irish citizens who draw UK pensions. I have an American friend (with only US citizenship, no dual nationality or any of that sort) who, though living in the US, draws a UK pension because he worked in the UK part of the year for a number of years. He didn’t realise he was due it until contacted by the UK authorities. I presume then that anyone of any nationality who has paid the requisite amount of NI contributions is entitled to the UK pension, though I think the amount depends on amount of contribution, number of years contributed etc. I believe that, as a result of the Anglo-Irish Treaty of December 1921, the Free State government took responsibility for payment of old age pensions in the 26 counties that the Free State controlled. This placed a huge burden on the finances of the new Free State. The cost amounted to 16% of total government expenditure. This led the Free State government to cut pensions by one shilling (5 pence) in 1924. The government of an independent Scotland would be free to try and negotiate a different/better deal but the precedent set in 1921 would be a problem. Don’t have my Irish history books to hand but from an internet search that seems to be right. (The family members who had both UK and Irish pensions had perhaps been working in the UK for a while and got entitlement there). Article 5 of the Treaty states that ‘The Irish Free State shall assume liability for the service of the Public Debt of the United Kingdom .. and towards the payment of war pensions in such proportions as may be fair and equitable’. Very vague and not clear from this what agreement if any there was about old age pensions. But then such pensions were non-contributory in the UK until 1925 so it’s not clear the Free State old age pension is relevant as a precedent to the current UK pension system. Also my memory from reading those books, which I confess is not tremendously reliable, is that shortly afterwards the Free State obligation was dropped by the UK govt and the debt thus forgiven: I would be interested to know what the facts are here, very relevant to your precedent argumennt. I’ve also been surprised to discover that my belief, quite a general one recent commentary has revealed, that pensions are paid out of general taxation is a myth. NI contributions pay into the National Insurance Fund for England, Wales and Scotland: separate ones for N.Ireland and Isle of Man, which funds certain benefits as well as a substantial chunk of NHS expenditure plus the State Pension. Surpluses of NI contributions over expenditure in any given year earn interest by being loaned to the Govt, so to be sure indirectly there is support from general taxation paying for the interest, and furthermore the fund is sometimes topped up from the Consolidated Fund so again not a total divorce from general taxation; but the state pension does appear to be largely funded from the NI pot. Clearly there are no individualised pension pots for each contributor and the earnings from surpluses presumably contribute a lot less to paying for current pensions than the earnings from assets built up in private companies. So you might say the argument that Scottish pensioners paid their NI contributions to the UK govt during their working lives so they are owed their pensions from that source, not a future Scottish government, rests on a false analogy with private pension pots. But firstly it is not clear that the analogy is so wide of the mark. Secondly, the UK government is clear that it wants to be the sole successor state should Scotland become independent and is clear that this means it will legally take on all the debt obligations, including as I understand it, pension obligations. It may well, in the negotiations over distribution of assets and liabilities, nonetheless say that Scotland is morally obliged to take on a liability to pay a pro rata a share of the UK debt and a pro rata share of the obligation that the former UK, via its National Insurance Funds, has to fund pensions to all its pensioners, which would no doubt come to pretty much the same as funding directly Scottish pensions. As I said above, I agree Scotland has those moral obligations but we have to look at net liabilities and I would argue those obligations are swamped, in financial terms, by the far greater liability of rUK to Scotland especially in respect of the gigantic subsidies, sucked out of us by deceit not informed consent , we pumped into rUK- at one point around one third of our GDP per year. Some thanks we have got too, being routinely insulted as subsidy junkies is our reward. You might say it’s a bit like the Germans calling the Americans subsidy junkies on receipt of Marshal Plan loans after the war except that these were loans not grants and nothing like the same size proportional to the American economy. Name me one country that the UK has given that sort of amount to as grant aid- I think one third UK GDP is around £600 billion a year currently- as an act of neighbourly friendliness. Certainly not Ireland! If Hammond announced £600 billion a year to Ireland in the Autumn statement, as atonement for the famine, I somehow missed it. Spending time working out that Scotland may, or may not be better off after independence is all very well, what matters is how the wealth is distributed. If we’re going to be worse off who will lose out? If we’re going to be better off who will gain? I bet I can guess but I’d like to see those producing all the figures spending a bit of time thinking about how it really impacts on real people. Without a distributional analysis it’s meaningless, worse than meaningless because it’s dishonest.